When ever I go to the beach I always have a memory in my mind of the first mole crab I found while digging when I was just a little boy. Every time I remember the experience I want to find another one, because I was too small then to remember exactly what it looked like. Since then I have only caught one, by chance, and it was great to be able to see it again. When I caught it, I wondered if I could eat it, what it tastes like or if it was poisonous. I have discovered that it can be eaten and tastes like prawns, so next time I go to the beach I will try to find one again and cook it up to see if it really does taste like prawns. One of the reasons why I have only caught one over a few years is because they are really good at digging into the sand and disappearing. They use their tail to get into the sand and then they use their "legs" to clear the sand and starts digging. 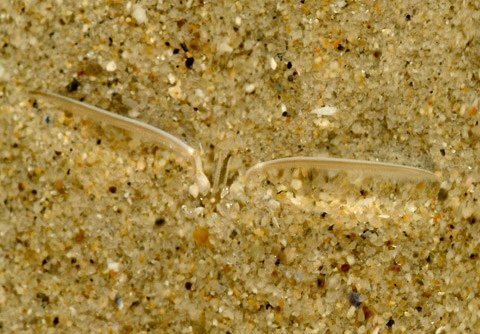 They do this in a matter of seconds and if you blink they vanish into the sand. They stay in the area of the sea where the waves break onto the sand and can be found almost anywhere on tropical and sub-tropical beaches. They are a few different kinds and the first picture looks like the one that I recently found. 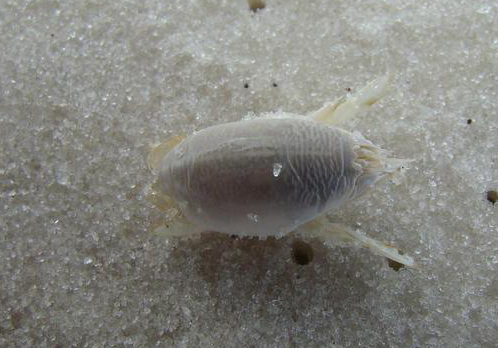 Mole crabs are filter feeders, I have never seen their antennae in action before, but the picture above is what they look like when feeding. They eat plankton and any organic substances that are small enough to filter and has nutrients in it. The picture at the bottom is of a mole crab with eggs. The orange is the eggs which eventually hatch into larvae that are like plankton. The eggs are really small and it looks like there are hundreds carried by the female, so it makes me believe there are more of them out there than I have seen. So I will keep a sharp eye out for them at the beach next time. Post of the day.nice photography.best of luck. amazing post, i remember being young and playing with crabs, now i'm land locked. I miss the ocean so much! keep up the good work! Thanks, being land locked isn't fun at all. you are doing really great job. I've seen people who have them in their fish-tanks. They live alongside some species of fish. Or is that not a Mole Crab? It might be a mole crab, I have never seen them in a fish tank before, so I don't know. They live along the coast off of Oregon. I also remember as a kid catching them in the surf. I think they like cold water. My favorite crabs are the one with one giant claw and one tiny claw. Fiddlers I think. Nice pics! and really nice post! Thanks for sharing! You have some really nice posts.